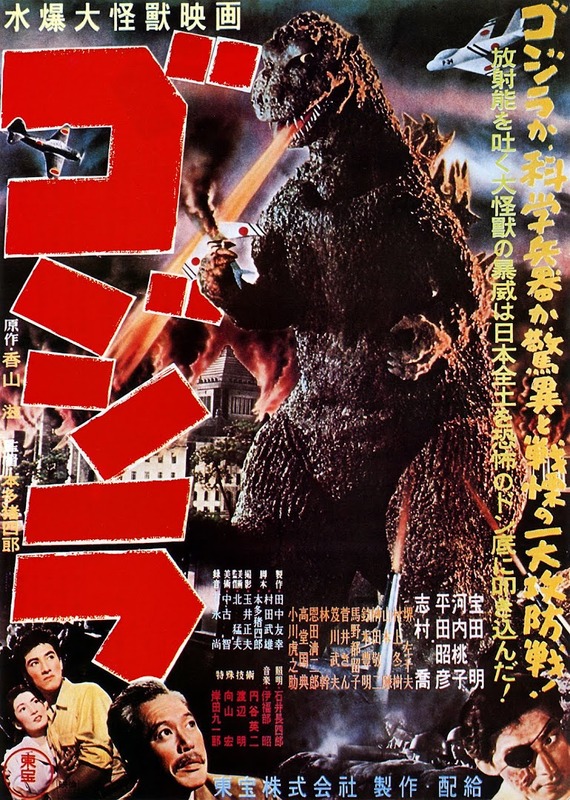 The Second World War produced many horror and paranormal-themed films. 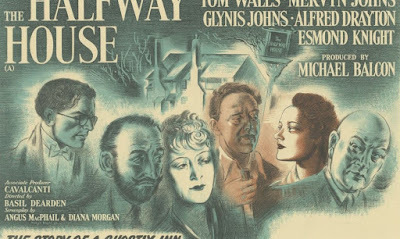 Some tapped into the anxious instability and paranoia at large in society such as The Ghost Train (1941); others feasted on grisly or fanciful myth as a respite from real-world fears (e.g any of Universal’s monster sequels). 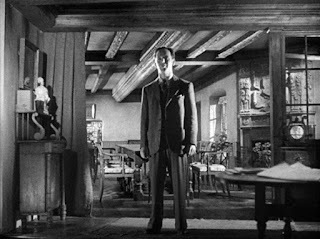 Another strain found lessons in hope from the supernatural as with 1941’s The Devil and Daniel Webster, or the spooky escapist fun of Noel Coward’s Blithe Spirit (1945). The era also produced cherished movies that managed to combine the eerie astral plane with a little welcome humour whilst never losing sight of optimism to combat the terrors and tragedies of a war-torn world. The most-loved and famous is arguably Powell and Pressburger’s A Matter of Life and Death (1945) whose hero, a courageous RAF fighter pilot (David Niven) is suspended in limbo between Heaven and Earth while waiting for love to triumph over Pearly Gates bureaucracy and return him to Kim Hunter. A year before, a similarly very English sensibility was applied to a beautifully crafted film whose protagonists would lend their after-life support to the earth-bound in need. The Halfway House was produced by Michael Balcon for the renowned Ealing Studios, famed purveyors of a distinct house style of eccentric comedies affectionately satirising the British way of life. 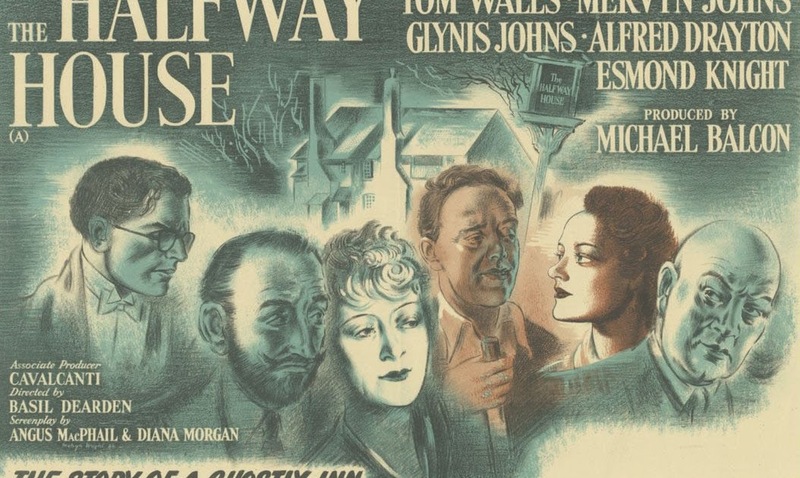 Their golden era was to come with superb films such as Kind Hearts and Coronets (1949) and The Lavender Hill Mob (1951), but already they had dabbled with ghostly guffaws in the Will Hay vehicle The Ghost of St Michaels (1941). The title takes its name from the Welsh countryside pub-hotel around which the plot centres. A group of disparate couples and individuals make their way to the Halfway House bearing heavy emotional baggage along with their luggage. We have former sea Captain Meadows (Tom Walls, movingly belying his theatre farceur background) and his French wife Alice (Françoise Rosay). His heart has been frozen into cold remoteness by the death of their son at sea; she is an open vein of emotional need, forced to seek her comfort elsewhere in spirituality. Richard and Jill French (Richard Bird and Valerie White) are a bitterly squabbling couple on the brink of divorce with a precocious teenage daughter hopeful for their reunion (Sally Ann Howes, later to be Truly Scrumptious in Chitty Chitty Bang Bang). Pat McGrath and Philippa Hiatt play an affianced couple whose relationship founders over his refusal to sacrifice Irish Republic neutrality to help the English. Not all the guests’ problems are connected with love, though they all need time for self-examination and healing within. David Davies (Esmond Knight) is a celebrated yet almost fatally driven orchestra conductor whose feverish work ethic may kill him in three months if he doesn’t take a rest. Shifty, bald-headed Oakley (Alfred Drayton) makes a black market living from cunning war profiteering, unconcerned about the morality of his activities. Guy Middleton adds another to his gallery of top-drawer cads as ex-army Captain Fortescue, newly-released from prison and with no direction as yet for how to start again. By seeming coincidence he already knows Oakley. There will be much stranger forces at work as the story unfolds. 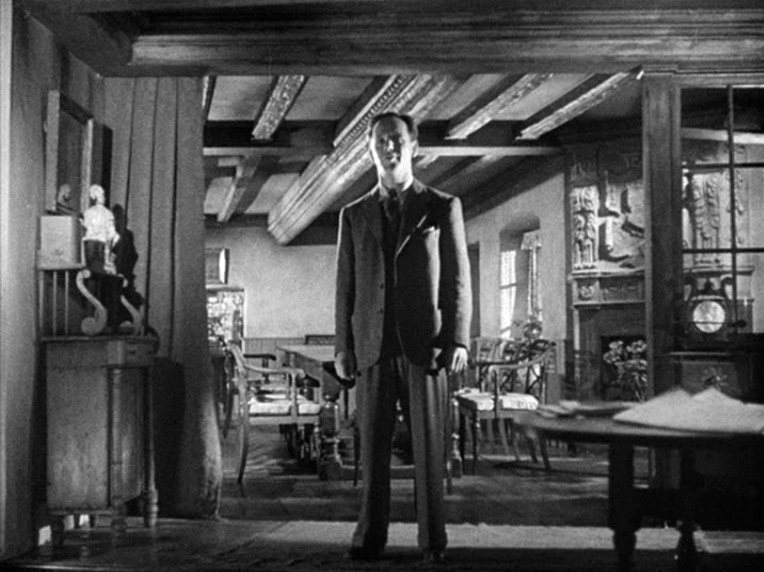 hints at something otherworldly in his sudden drawing-room appearance from nowhere in front of the weary Fortescue. His daughter Gwyneth (real life daughter Glynis Johns early in her impressive sixty-year movie career) has an enchantingly husky voice and a penetratingly knowing manner. From their first meeting, the guests sense that the pub is oddly not quite of its time – indeed all references from newspapers, the calendar, even the Guest Register suggest that it places itself exactly one year in the past. That’s not all. Neither Rhys nor his daughter cast reflections in a mirror or a shadow on the outside lawn. They seem benign though rather than covert horror-movie vampires. Most disconcertingly, each member is made to feel that they were expected, and the intimate details of their lives precede them. The Halfway House gradually becomes a counselling haven in which Rhys and his daughters tenderly go to work in private upon each unresolved soul under their roof. These scenes are very poignant, partly for the artful dialogue which allows advice to be both boldly stated and at times delicately and wordlessly left unstated. Over dish-washing, Gwyneth buttonholes David over his secret fear of dying with a beguiling mix of sense and sensitivity. She compares death to an opening door through which “It’s better to walk up and knock bravely than to be carried through it”. David is cut to the core by the scalpel she uses expertly upon his heart. How could she know so much? She gives the clearest indication yet of who or what she and her father represent: “Because you’re coming our way”. What equally makes this a profoundly moving film is that it reminds us of how war is fought not only on epic public battlefronts, but in personal sometimes secret conflicts – and that its impact is universal no matter how we may try to hide. For a studio whose films were so singularly British, the lives in crisis here belong to Welsh, English, French and Irish Republic civilians. Little by little, icy barricades dividing the couples begin to thaw. 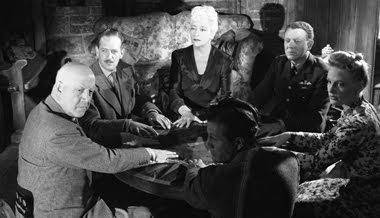 Captain Meadows quickly regrets maliciously spoiling his wife’s séance with a radio broadcast passed off as being from their son when he sees how much he has hurt her. In their room his confession - “To share him with a bunch of strangers was more than I could stand” - is delivered with heart-rending subtlety as befits a man who once emphatically stated he was not a talker. Oakley’s blood-money shenanigans are exposed by Rhys: “An evil undiscovered is not an evil unpunished” showing him that he must mend his ways. Richard the Fence-sitter is also given a foaming tankard of brotherhood on the house: “I wouldn’t put the betterment of Wales before the betterment of humanity” Rhys tells him. After she fakes a boat capsizing with Meadows (who we discover in his forty-year naval career couldn’t swim) she comes over all Sarah Bernhardt melodramatic in her grand bequeathing of possessions to her parents capped with a prong of emotional blackmail “And I forgive you both for trying to make me half an orphan”. Howes’ Joanna is reminiscent of the winning Virginia Weidler, Katharine Hepburn’s little sister in The Philadelphia Story - she manages to be both charming and personably pushy without making you wish someone would push her off a cliff. As the house is once again demolished, all the guests’ lives and relationships are being rebuilt. Through montage, they resolve themselves to start again in snatches of inner monologue. The film closes with Rhys’s optimism: “Your lives make up the world – and it is a good world” and an apt rendering by David of the 23rd Psalm. 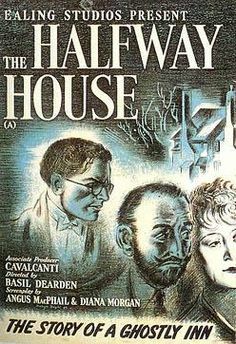 The Halfway House is a criminally overlooked gem of poignant paranormal-tinged drama and marvellously affecting performances. Fans of A Matter of Life and Death may well enjoy it as a sister film, dealing with similar themes and sharing its warm generosity of spirit(s) when a suffering world cried out for positive encouragement. The following year however, Ealing would present an acknowledged classic - directed again by Basil Dearden and re-teaming him with Mervyn Johns. This was the full-blooded horror portmanteau film Dead of Night (1945) memorably starring Michael Redgrave in the role of a tortured ventriloquist.